I’ve been trying to incorporate better for me foods into our family dinners for quite some time. one place we can make a change is adding more grains and vegetables. 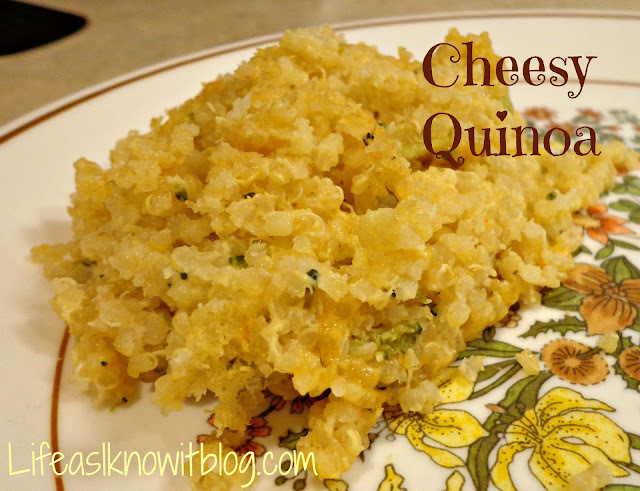 I pinned this recipe for Cheesy Quinoa a couple of weeks ago after my mom gave me some Quinoa to try. I had no idea how to prepare it, so this was a great recipe for me to get started. I added broccoli and cauliflower as my vegetable(s) of choice. I served this with a turkey meatloaf and I thought it was delicious. The guys in my house, however, didn’t feel the same. I put on there plate, Tyler wasn’t having a 2nd taste of his! I’ve had some Quinoa in this house that a friend left, but I have yet to make a dish with it. I will try this out! I’ve pinned this and really want to try it. I love quinoa!